They say that all good things must end, and sad to say, our cruise was no exception. We spent the last week cruising north through Chilean waters, but unfortunately had to bypass the fjord region because of a medical emergency. The captain had to take the fastest route possible to the next port, and that did not include meandering between dozens or hundreds of rocky islands. He shaved 12 hours off of the travel time over 2 days. Although the ship is prepared for medical problems, it comes at a cost; we heard through the grapevine that the medical care costs of the patient onboard reached $20,000. 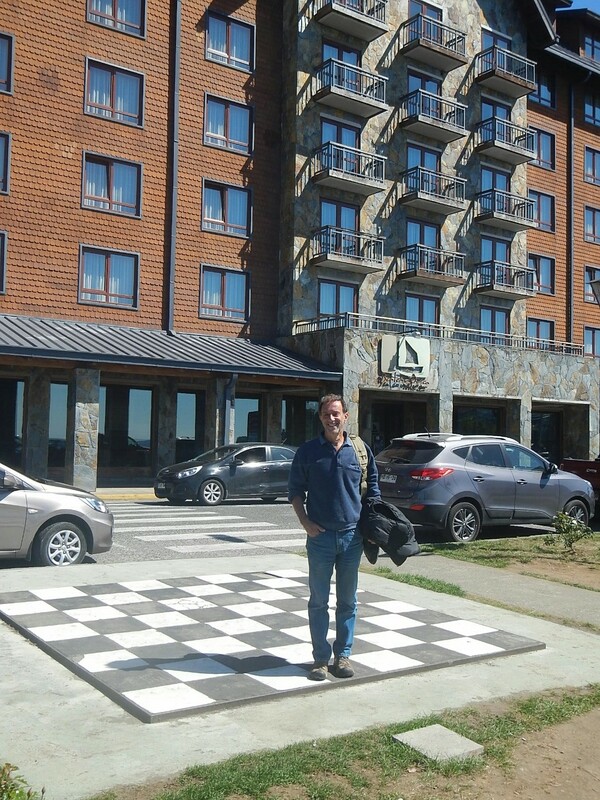 Afterwards we had two port stops: Puerto Chacabuco and Puerto Montt. 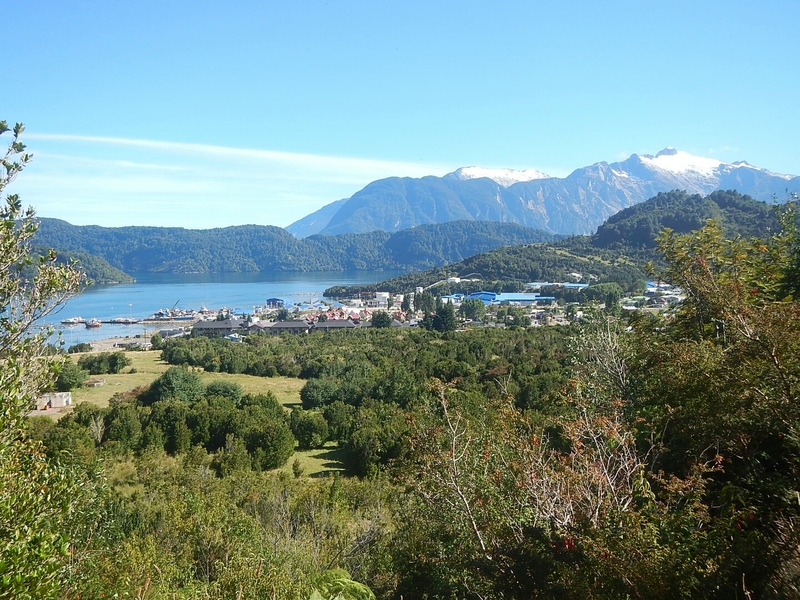 The approach to Puerto Chacabuco took several hours of winding down a long inlet, with spectacular scenery along the way. The inlet ended in a deep basin big enough for a couple of cruise ships to swing around at anchor – which was a good thing, because although Puerto Chacabuco has a only about 1000 inhabitants, we happened to be there on a day when a second cruise boat was passing through from the other direction. All of the local transportation was quickly “soaked up” by prearranged excursions, so we were unable to arrange for a rental car or taxi to take us to neighboring sights. We poked around town for a bit, looking for a trail that would take us up into the local hills, but took 2 or 3 false starts, ending at fences marking off private property. We sat down in a shady spot by the side of the road in a quiet neighborhood overlooking the harbor, and struck up a conversation with a local who was walking by. He took us to a gate a couple of blocks away, clearly marked “Private Property – Do Not Pass”, and told us that if we climbed over the fence (there was a stile right next to the gate), then we would find a trail that went around the harbor. Emboldened by his permission, we set off on a delightful walk through the woods. The trail began as a road, but soon shrank to a walking trail that slowly and steadily climbed as it traversed the harbor. We stopped for a bit at a sweet stream burbling its way down to the harbor, and drank in the view, enjoying the observation that we were above the level of the cruise ship’s 12th floor. As we retraced our steps, we passed a local walking the same trail and were reassured that we weren’t too far out of line by crossing that gate. The stop at Puerto Chacabuco was a short one for the cruise boat, since under normal circumstances the entrance through the inlet is done pre-dawn and they want the opportunity to see it during the afternoon daylight hours. It was every bit as beautiful in the other direction! Puerto Montt is a much larger town, set in a highland lakes region. We tracked down a local bus to Puerto Varas, which is right on one of those lakes and is the gateway to some nearby parks. Although there are volcanos, waterfalls, and significant amounts of amazing scenery, we decided to forego a “quickie” trip that day. We spent a couple of hours wandering around the town, whose architecture has a huge German influence. We found a toy shop that carried a magnetic chess set (we had been looking during the last several stops, and even learned the Spanish for this unusual purchase: “juego de ajedrez magnetico”), so we were thrilled to walk away to actually find one (playing on the computer just doesn’t have the same feel). We even played a game while sitting on a park bench before returning to the ship. A few more things that we enjoyed about our cruise: There is a small netted off area on the top deck with a couple of ping-pong tables. There is an ice cream bar open all afternoon. Even after two weeks on the boat we were discovering new features. They have a naturalist on board who gave a talk every morning that we weren’t in port. Peter was excited to hear about our travels, and reminisced with us about his days of backpacking before he “settled down”; now he splits his time between an organization he founded to train tour guides in Vietnam and sharing his knowledge on this boat. He’s been around the Horn more than 40 times! Last – but definitely not least in our hearts – we met a couple at dinner one night who we really hit it off with. Michael and Cate are two nurses from Indianapolis that think about life in similar ways to us. We hope that you’ll hear more about them in future updates! We pulled into Valparaiso early on a Saturday, found the bus station with our new friends and fondly bid them adieu. Then we wandered off to a nicer part of town to find a hostel. This port city is quite picturesque, although like many cities it can vary quite a bit from one neighborhood to the next. It’s built on a series of hills clustered around a huge bowl of a harbor. 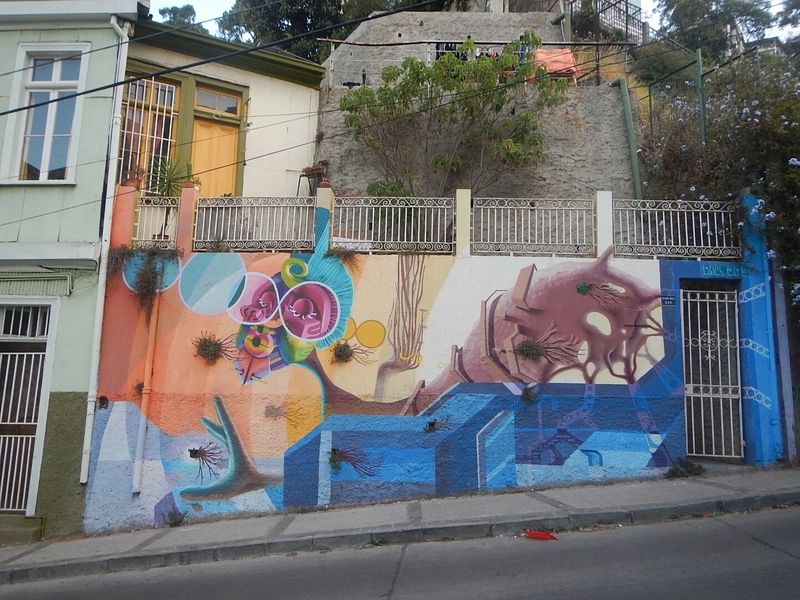 The centrally located neighborhood that we enjoyed is centered on Cerro Alegre (Happy Hill). A number of the hills have an inexpensive funicular allowing one to bypass the stairs, and we took it just for fun! This neighborhood is geared towards tourists: loaded with hostels, restaurants, and boutiques. 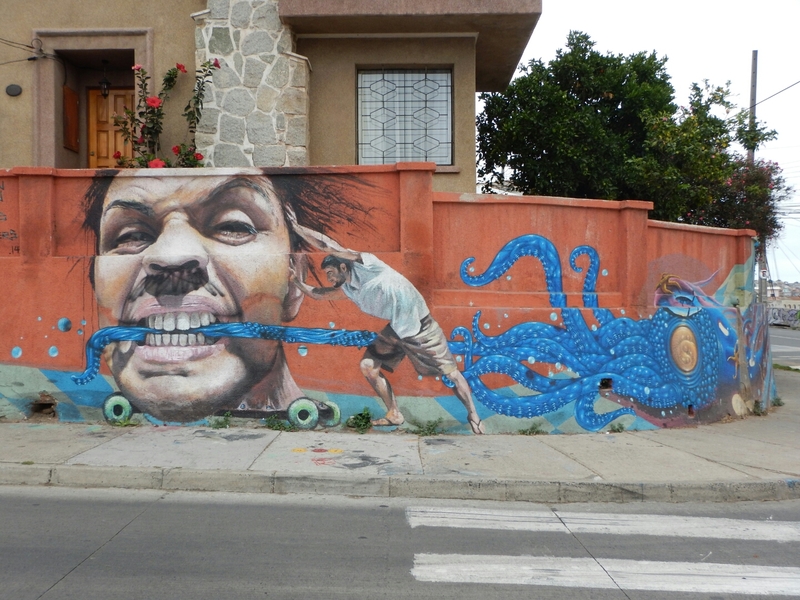 There are wonderful murals painted on virtually every building, many of them quite creative. Although there are lots of walking tours around town, we ended up crafting our own. We wandered up in search of a great vista, which did not take long. 🙂 There is lots of maritime activity, including navy boats, freighters, tour boats, fishing boats, and of course the occasional cruise boat. The hills are covered with cheerfully painted houses in pastel hues. There are quite a number of churches in this city, many of them with distinctive spires. It was fun to hear them all ringing one evening around 7pm; they weren’t well-synchronized, so the peals seemed to drift around the city. We enjoyed our first empanadas (playfully described by our naturalist friend as “bundles of joy”), and found a chocolate shop that made bars on site. We got a couple extra for the road. After enjoying a couple of fairly leisurely days in Valparaiso, we began our backpacking trip north, starting with a 15 hour overnight bus to La Serena. The long-distance buses are double-decker, with fully-reclining seats on the lower level and ‘semi-bed’ recliners on the upper level. We opted for the ‘semi-cama’ class, and both loved the views during the daylight hours but regretted the choice during the night. The costs are reasonable – we paid about $20USD for this trip, but since we will be traveling 2/3 of the length of the continent, they will add up! Although the town of La Serena is a beach town and a university town, it did not grab our hearts. We stayed in a hostel that was part of a family’s home. It appeared to have 2 or 3 generations of women running the business, but no men (or anyone else!) helping to keep the place in good repair. We’ve noticed that the homes and even shops in these countries south of the US have a different division of inside and outside than we are used to. For example, the sitting room in this home/hostel had a ceiling originally open to the sky, but later covered with a very light, flexible plastic sheeting that let in light and, since the panels weren’t sealed to one another, rain. This country is fairly dry, though, so a couple of buckets have a subdued (but continuous?) presence in the room. There was another living space that they called their terrace, which also had a half-in, half-out feel to it. It had a couch and table arrangement, opposite a work-out machine. This room had a couple of guitars tucked in the corner, which caught Dan’s eye, so one afternoon he enjoyed a few minutes of strumming and reconnecing with his inner musiician. We visited a Chinese restaurant one night and puzzled over some of the items on the menu, in particular a whole section called “Teeth of the Dragon”. When we asked, the proprietor disappeared for a moment and returned with a small bowl filled with bean sprouts! Just a 10-hour bus ride away, our next stop was San Pedro de Atacama, a small town that has become the gateway to the recreational delights of the Atacama Desert, including trips to nearby Bolivia (since Bolivia charges a $160 “reciprocity fee” from Americans for a visa, we sadly chose not to head that way). For this leg we took a daytime bus, and enjoyed the spectacular scenery all the way. Although it’s extremely dry and there isn’t much foliage, the mountains are created from colorful rock, pushed up from an ancient seabed and slowly eroded over eons to form a myriad of shapes and features. 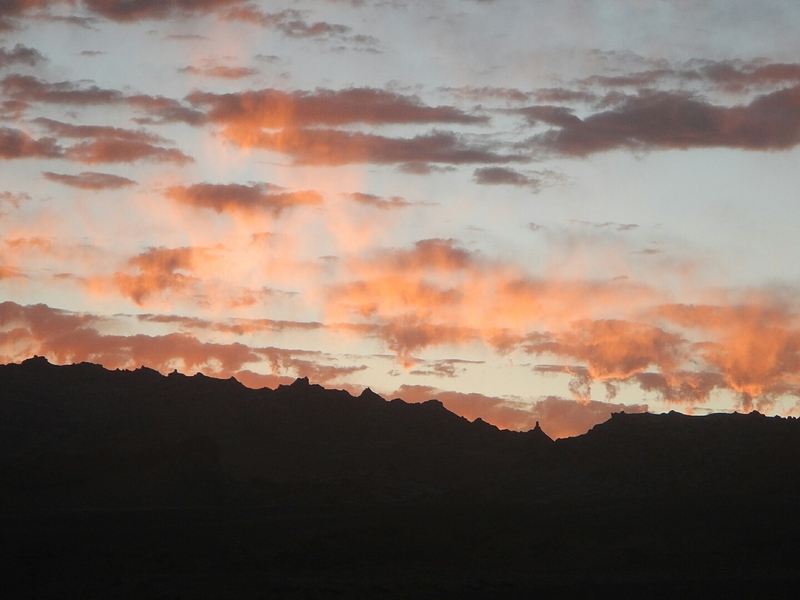 The region boasts volcanoes, geysers and canyons. The moment we arrived we were “invited” to sign up for numerous tours of the region’s highlights. 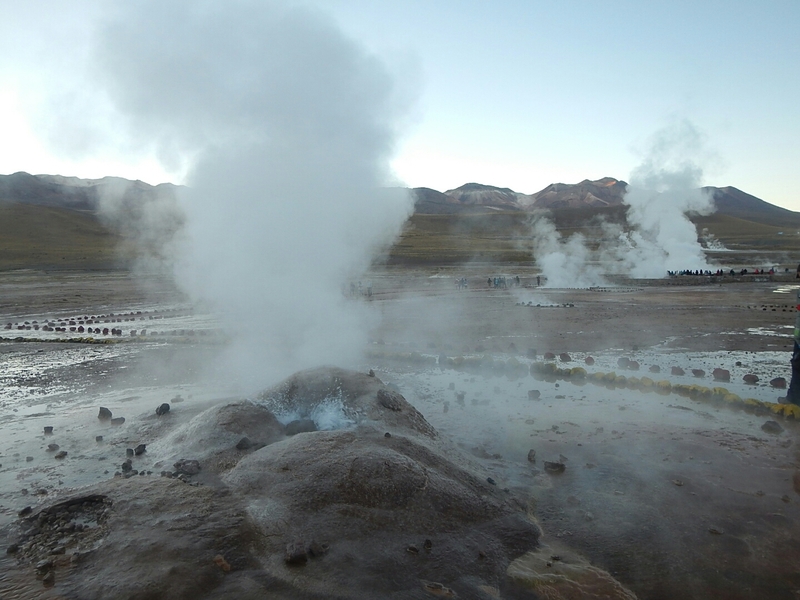 After settling into a hostel, we ended up signing up for a half-day trip to see the nearby geyser field – a couple of days later. First we wanted to do the usual chores: bank, food, figure our way around town. In addition we decided to stop by a pharmacy to pick up some medicine for a cough that Dan had been fighting for more than a week. They recommended that we go to the public health clinic and see a doctor. Although it took us the better part of the afternoon, it was a good choice. The doctor he saw treated him respectfully and knowledgeably. She gave him a treatment that helped clear his lungs immediately, wrote a prescription for an antibiotic, and tested him for tuberculosis (since he had told her that his cough had lingered for a long time). 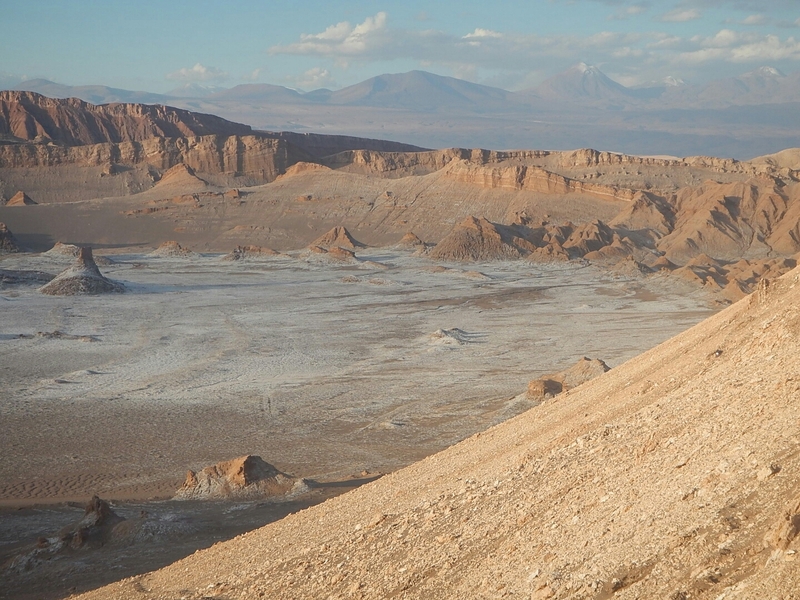 Chile’s president has set a goal to have Chile be a First World nation by 2020, and although it may be a stretch goal, we’re impressed that they’re even in the ballpark! The medical care here felt like there was more centralized oversight than in some of the other places we’ve visited. We ran into no graft, or even talk of it, and banks were readily available. As with most places around the world, though, conditions vary widely between the large cities and all of the smaller and more remote towns. Even in Valparaiso, we were surprised at how inconsistent the sidewalks were – and the amount of dog poop and litter all around! The infrastructure of roads varies a lot from one region to another – even some of the roads traveled by the larger buses are still just packed dirt. We did see a number of extremely poor neighborhoods with abysmal housing, clearly without power or running water. We don’t know the specifics of his plan, or how they are progressing, and although it seems unlikely that they will fully attain that goal in just a few years, it is admirable that they are striving to improve their country. Unfortunately the task is made more difficult by the current downturn in commodities. 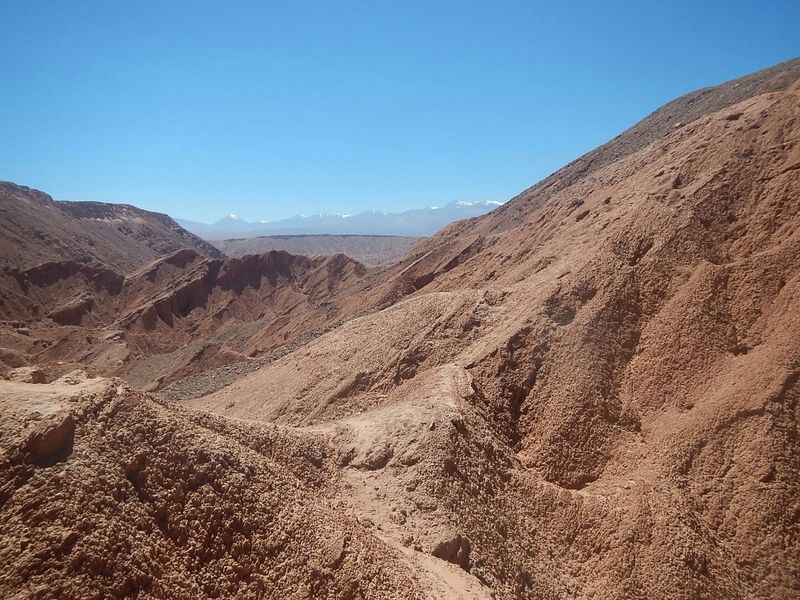 Chile is a major exporter of copper (and other precious metals? ), and many of their mines are shutting down. We were pleased to see several wind farms and solar power stations, mostly in the desert. (Dan flirted with the idea of turning Lungta into an electric vehicle by removing our sails entirely and replacing them with two of the huge windmills. Unfortunately, the multi-million dollar price-tag is out of our reach – at least for now! 🙂 ). The geyser tour turned out to be an excellent choice. It leaves at 4:30am – they told us that it was to maximize the temperature differential that drives the geyser activity, but we’re not sure that makes sense. There are over 100 vents and geysers in the area, which created a somewhat surreal scene during the pre-dawn hours when we arrived. There were clouds of steam rising from rocky creches in the sandy terrain all around, some of which also contained small pools of near-boiling water. Our driver/guide immersed a sack of eggs and boxed chocolate milk in one of these pools, and 10 minutes later served up a cute breakfast of hot chocolate, hard-boiled eggs, cookies and cheese sandwiches. He drove us to a handful of spots with clusters of geysers, and explained that some are continuous and some erupt periodicallly. The feel of the place changed over time as the sun came up, but the geysers continued to do their thing. There was a swimming hole warmed by geothermal water, and we took a dip – it was fun, but not quite warm enough to make us glad to get out again. On our way back to town, we saw a variety of local wildlife, including vicuñas (related to llamas, but undomesticated and even smaller than the guanacos we saw in Argentina), flamingos (three varieties! ), and long-tailed rabbits. We also stopped at a place the driver called Cactus Canyon that had experienced significant flooding in February that had completely changed its character. He told us that it used to be a lush area filled with pampas grass and small shrubs, but what we saw reminded us of the Toutle River Valley after the Mount St. Helens eruption. That afternoon, we rented a pair of bicycles and headed out of town to visit the Valle de la Luna (Valley of the Moon), reputed to be THE place to watch the sunset. We pedalled through a blessedly flat valley to get there, but once we arrived the park road bent upwards and did not promise to let off. We resorted to walking our bikes for a while – you know, just to the next bend – when a red SUV pulled alongside us and offered a ride. We didn”t hesitate a moment before tossing our bikes in the back and climbing aboard! Although we just thought we’d go to the nearest site with a western view, our host took us all the way to the end of the road (only about 12km/7miles). There was an abandoned mine there that we poked around for a short while, amazed that the deep entrance wasn’t cordoned off in any way, not even any signage! Two of the 3 guys in the car climbed roughly 20 feet down to see if they could see any water (not! ), while we enjoyed the magnificent view. We retraced our route to the best sunset-viewing lookout and went our separate ways. After locking our bikes up in the parking area, we followed the well-trodden path 3/4 of a mile and up maybe 750 feet to a ridgeline at the confluence of several canyons. The view was indeed amazing! And we didn’t arrive a moment too soon; we only spent about 15 minutes there before the sun was moving behind the mountains. Kathy was nervous about being on the highway after dark, so we headed back down the hill and made our way down the road. As we rode, the sunset continued to develop. This evening was the only one we saw where there were a good number of clouds in the sky, which made for a gorgeous sunset – the sky behind us seemed on fire as we exited the park! Although we did indeed end up getting home after dark, the flashlight that Dan had packed assured that the journey was uneventful. As we had rented the bikes for 24 hours, we still had them the next morning. Although we had intended to get an early start, to take advantage of the cool morning temperatures, we were tired from our ride the previous evening (and also our butts were sore!). So we didn’t get out of town until almost 11. This time we headed into a different canyon that we had heard would be unlikely to have many tourists. 🙂 The route took us along a wide creek with huge hills on either side. About 6km/4miles in, there was a fork to the left that mentioned a tunnel (“tonel”). Being the curious sort, we followed that path, which turned upwards fairly quickly and did not slacken for quite a while. The road had clearly been designed for vehicles, but we kept wondering why anyone would go to such trouble out here in the middle of nowhere; perhaps mining? It had not been in use for quite some time, though; it was rough and pitted and there were quite a few large holes, some of them in man-made stone bridges that were open below. We wore out quickly and ended up walking our bikes more than a mile constantly asking ourselves if it was time to turn around. But we finally reached the entrance to the tunnel, which was marked “1930”. We walked its length, perhaps a quarter of a mile, passing a short section where a portion of the roof had collapsed (!). The other side gave us no more of a clue than the first as to why all the effort had been expended to build this road and tunnel. As we looked around, a couple emerged from the tunnel and we struck up a conversation. He was the organizer of an annual mountain-bike race that went down this road, and was investigating the state of the road, to evaluate how safe it was and develop plans to get an ambulance there if needed. 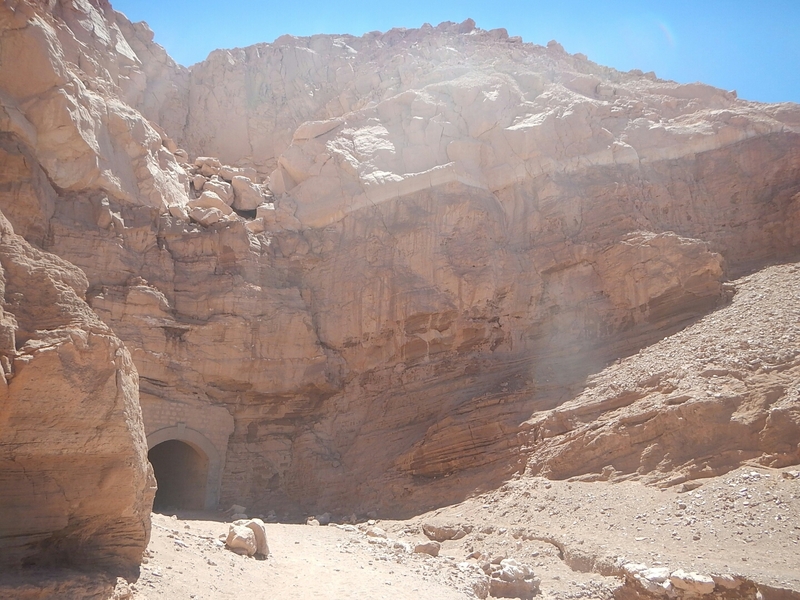 He told us that this was the old road to Calama, the nearest city, and that there was no mining in these hills. Mystery solved. 🙂 Our trip down was exhilarating (but uneventful), and we were wiped out by the time we returned our bikes that afternoon.